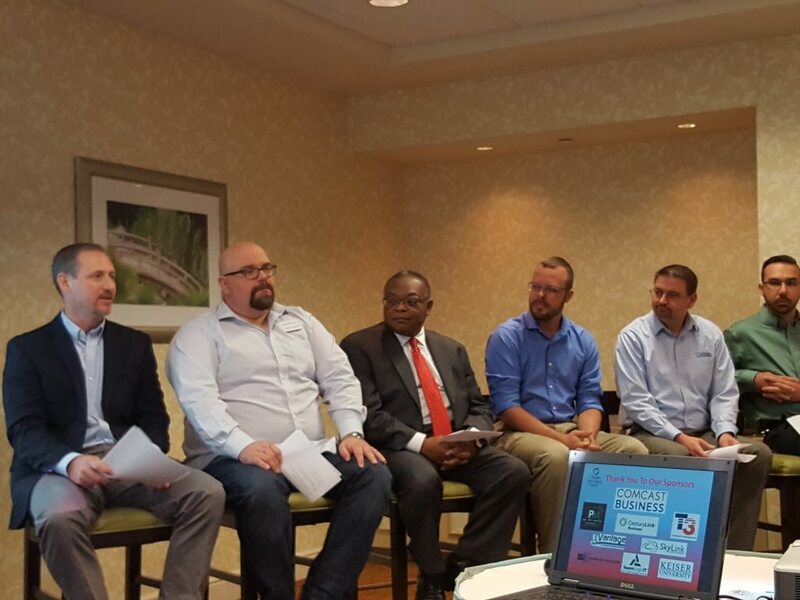 Panelists (Left to Right: Bob Roloff, Jacob Ackerman, Dr. James Stewart, ITL, Jeremy Stakely, Dan Pfrommer, Brett Bisbe) answer participants’ technology questions at the 2016 Get Connected Technology Breakfast in Fort Myers. On November 16, 2016, small businesses came together at the Hilton Garden Inn in Fort Myers for The Greater Fort Myers Chamber of Commerce’s 2016 Get Connected Technology Breakfast. Targeting entrepreneurs, small business owners, help desk managers, technology consultants, and technology vendors, it featured an experienced panel of of IT experts to help tackle the community’s technology questions and challenges. Moderated by Mike Jackson, APR of Jackson PR, the diverse panel had two focuses: to convey new technologies useful to today’s small businesses and teach participants how to incorporate them into their budget effectively without interrupting daily operations. The panel was made up of six individuals, all from different companies and areas of the technology industry, including Jacob Ackerman, Chief Technology Officer at SkyLink Data Centers, Dr. James H. Stewart, Jr., D.Sc., MA, ITIL , Chair of IT and Cyber Forensics at Keiser University, Brett Bisbe, Owner of B2 Technology Solutions, Bob Roloff, President of TeamLogicIT, Dan Pfrommer, Senior Sales Engineer at CenturyLink, and Jeremy Stakely, President of ITVantage. Based upon survey results obtained from chamber members, the technology forum focused on three main topics: infrastructure, web, and security. Infrastructure related matters were by far the most requested by chamber members. Specifics included how to choose cloud solutions versus managing your own internal servers and other equipment. SkyLink Data Centers’ CTO Jacob Ackerman offered to provide a complimentary consultation with any company that is going through this decision making process. Another hot topic was policies and strategies around Bring Your Own Device (BYOD), which is very common in business these days. Questions related to web included some of the best way to manage a website. Panelists covered hosting and security, as well as ideas for integrating customer relationship management software and other forms of automation. Data security was also high on the list of hot topics. The audience wanted to know more about how to protect themselves and their institutions. For example, when you’re working at Starbucks and using their WiFi, how can you protect your device and data from being hacked and intercepted? Ackerman offered even more basic advice. Solid surveillance and efforts to protect internal data should never be taken lightly. While hackers are known to use some pretty advanced techniques, sometimes the biggest breaches are made in plain sight. There are millions of malicious websites and executed attacks made in 2016 alone that affect both desktop and mobile devices. Using digital and social engineering tactics, hackers have become remarkably competent in penetrating business networks and databases, making cyber security an imperative initiative. “You are constantly facing hackers who are continuously improving their craft,” Ackerman said. If you’re concerned about the safety of your servers, contact SkyLink Data Centers today at 239-403-2950 to see how you can protect your sensitive data from malicious attacks using the best software and hardware without buying it outright. Simply ask to learn more about colocation services.